Burude means the skull in Kannada (local language of Karnataka). This waterfalls is about 20+kms for Siddaput and 55kms from Sirsi on Siddapur-Kumta road. 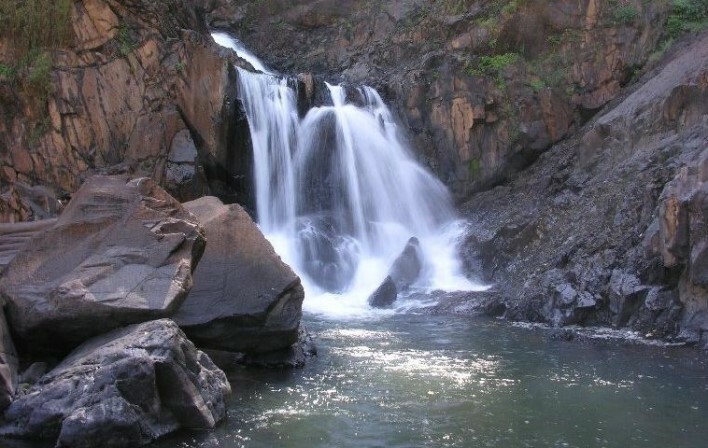 One needs to trek through a small creek to reach the falls in summer. In winter and monsoon it becomes almost impossible to access the valley and falls. Hundreds of people watch the spectacular view of waterfalls from an stage setting. The mist adds to the scene. The other side of the waterfalls will need some serious climbing. The last stretch of the water fall may be heard. This requires 2 day stay. By road: On the way to Kumta from Siddapur after Kyadagi (1+kms) you will get down at iLimane cross and take a walk for 5+kms to reach the waterfall. Nearest Railway Station: Siddapur town. By Road: From Bangalore 450 kms, Siddapur 20 kms, Sirsi 45 kms.